NETWORK UPDATE: Yes, both ABC shows climbed in final numbers, 0.1 bumps for DANCING WITH THE STARS and CASTLE. There was also an 0.1 increase for THE BIG BANG THEORY. On NBC, THE VOICE grew by 0.1 but THE BLACKLIST lost the corresponding tenth. ESPN’S MONDAY NIGHT FOOTBALL naturally dominated all of television, even beating THE BIG BANG THEORY, but its 4.82 was down almost half a point from last week’s game. 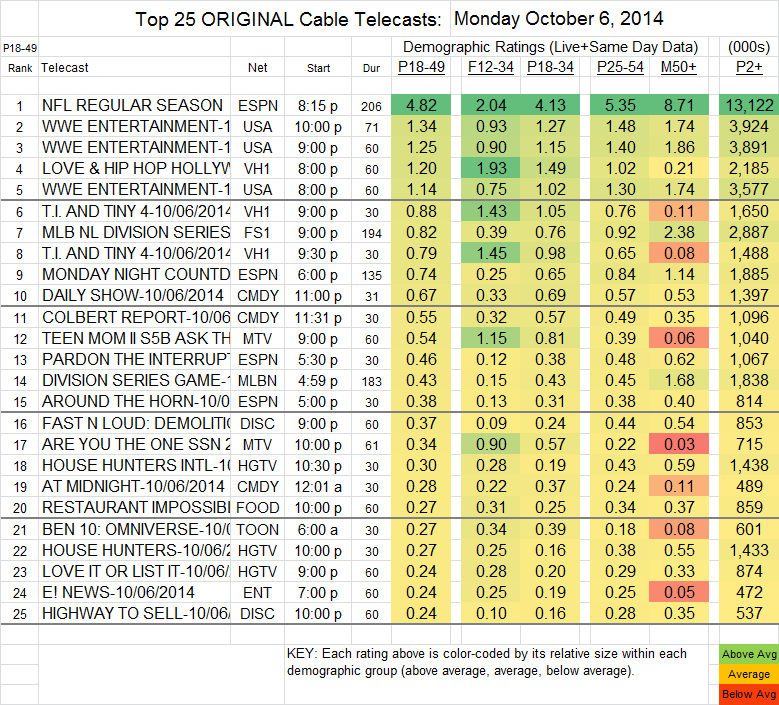 The 3 hours of WWE on USA were at 1.14-1.34, down 0.12-0.26 from last week. On VH1, LOVE & HIP-HOP HOLLYWOOD lost 0.12 to hit 1.20, then 2 episodes of TI & TINY, at 0.88/0.79, were both below last week’s 0.96. The primetime BASEBALL PLAYOFFS game on Fox Sports 1 was at 0.82, with the early game on MLB Network at 0.43. FAST N LOUD (Discovery) dropped 0.13 from last week to 0.37. A TEEN MOM special on MTV was at 0.54, leading into the season premiere of ARE YOU THE ONE? at 0.34.